...and reading this document is the first time I learn the names and ages of my maternal grandfather's first children, my mother's half siblings, and therefore, my half aunts and uncles. Names, ages and places of residency of minor children: [in 1914] Charlotte, 16 yrs. John 14 yrs. Mary 9 yrs. Bertha 9 yrs twins) all reside with mother in Austria. All are certainly long dead, and even their children, my half first cousins, are probably dead, or very old. 1. Why is Charlotte/Carolina still listed as his wife, even though he finalized his divorce from her in July? Is it because it would have been unseemly to list children without a wife? 2. Carolina or Charlotte? The fact that the eldest daughter is named Charlotte leads me to believe this is the correct name. Did the bureaucrats just write down any name starting with a "C" or perhaps they couldn't read John's handwriting? Is it possible John purposely gave two different names? That seems far-fetched as he wanted to become a citizen and wouldn't want to jeopardize that process, but who knows? 3, Did Charlotte desert John and then run away with another man in Austria, perhaps to marry him? 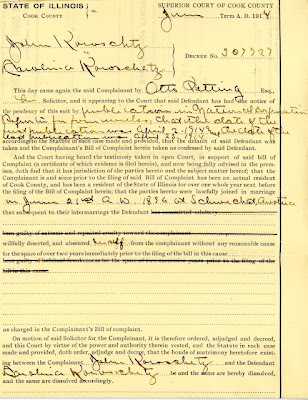 If she had deserted John Koroschetz in 1908, (before he left for America), as he claimed in the divorce decree, she was caring for a ten-year-old, eight-year-old, and twin three-year olds at that time. A woman with four young children at the turn of the twentieth century didn't have a great many options for making a living, especially with four children in tow. She would have needed a man to survive. 4. Did Charlotte file for divorce in Austria, claiming John had deserted her? One day I hope to search out more information about these half-siblings of my mother, of whom she never spoke until very late in life and in whom she expressed no interest. Zero. But the joy of that birth was tempered by a death. By the time John became a naturalized citizen, World War I had been waging since the first official battle in July, 1914. 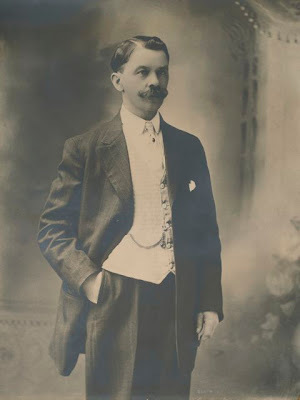 My Dad's mother, Lisi's younger brother, Samuel Ebner, had been killed in The Battle of Galizia (see The Fallen, Part I) in August, 1914, at the age of twenty. 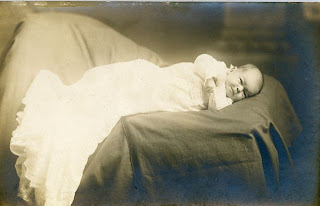 It wouldn't be the last time in my family's history that the grief of death and the happiness of birth co-mingled. Next week, John Koroschetz and Louise Woschkeruscha find each other and marry, almost two years after John's divorce. After arriving at Ellis Island in 1908, and living for a time in Buffalo, NY, John Koroschetz eventually made his way to Chicago. I know very little of what he did in the six years between 1908 and 1914, but I presume he worked as a machinist or tool and die maker. 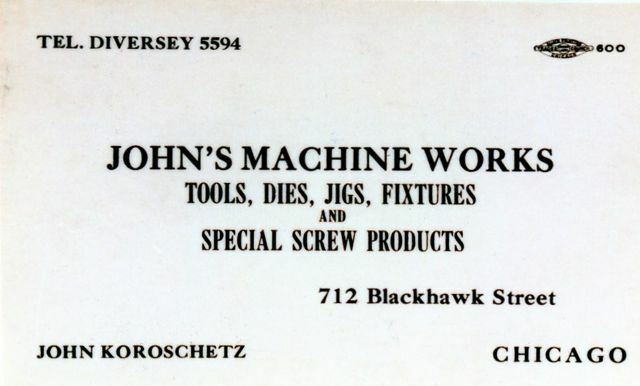 Here's one of his business cards, but I'm not sure of the year. 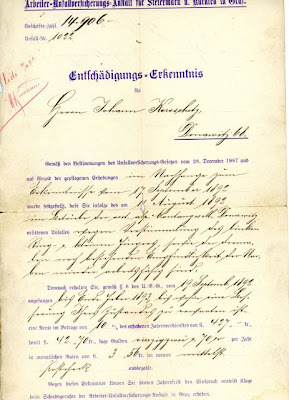 In 1914, he made two life-changing decisions: In April he took the first steps to obtain a divorce from his wife who still resided in Austria. This page of the divorce decree states that John published, in a newspaper, his intention to file for divorce, as is required by law. He published on April 2 and April 23, 1914. I'm not sure where he published, perhaps in Chicago, perhaps in an Austrian paper, though the latter is unlikely. The idea is that the party being sued for divorce, the defendant, in this case, John's wife, Carolina, is made aware of the lawsuit. 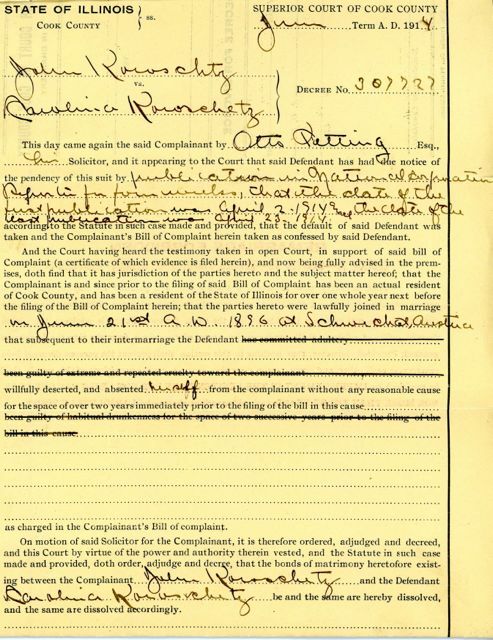 On July 8th his petition for divorce was presented in court, and the divorce was finalized on July 10, 1914. The reason for the divorce can be seen in the middle of this page. 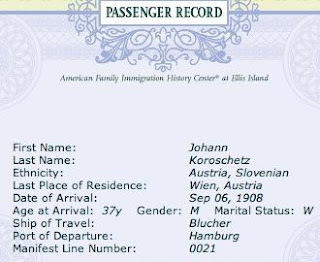 It notes Carolina and John were "lawfully joined in marriage on June 21, 1896, in Schwechat, Austria, about 5 miles southeast of Vienna. 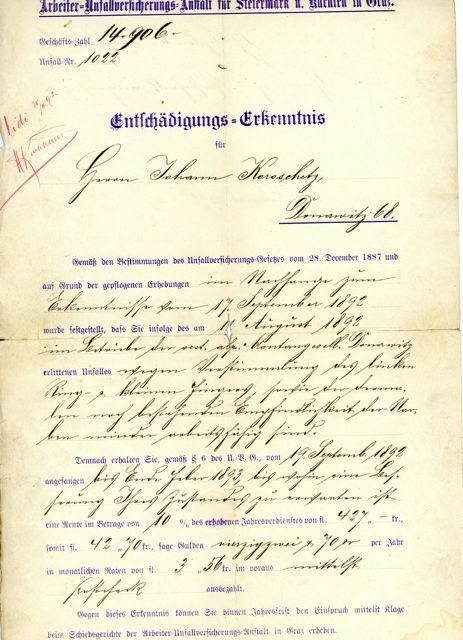 In the detail above, you can see that printed right on the form, are several possible reasons for divorce (perhaps these were the only valid reasons at the time). Each INAPPLICABLE reason is crossed out (see above). has willfully deserted, and absented herself from the complainant without any reasonable cause for the space of over two years immediately prior to the filing of the bill in this cause. THIS IS THE ONE. 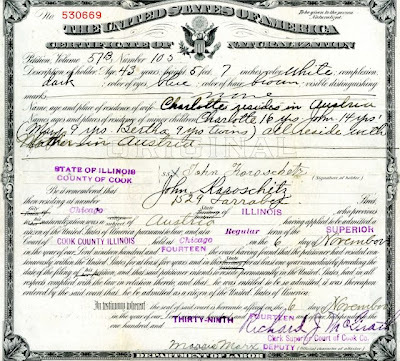 John left for America in 1908. Had his wife deserted him before he left, taking all their children with her, and who were those children? They're not mentioned in the divorce decree. Nothing is impossible, but I find it hard to believe that John would have been the one to do the deserting. I know my mother adored her father, and he was completely devoted to her, dropping everything to rescue her when her car broke down, crying when she brought home her perfect report cards. I find it difficult to believe that a man who showed such loyalty to the daughter of his second marriage would have abandoned his four children from his first marriage. A bold and stern warning is written on the back of the page shown above, in bright red type so you can't miss it. "IMPRISONMENT IN THE PENITENTIARY FOR NOT LESS THAN ONE YEAR, NOR MORE THAN THREE YEARS, and said marriage shall be held ABSOLUTELY VOID." My guess is that John didn't yet know my grandmother, Louise, or at least had no plans to marry her at the time of this decree. Otherwise they would have married as soon as the required year had passed. 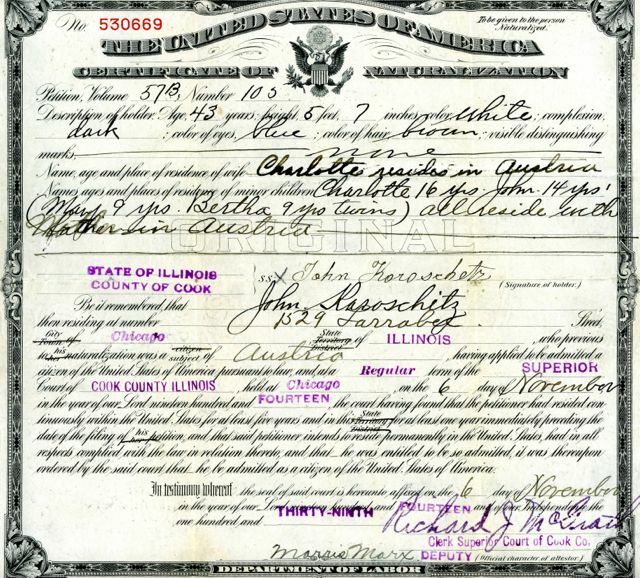 Four months after the divorce, in November of 1914, John Koroschetz took another life-changing step: he applied for U.S. citizenship, and on his naturalization form, we learned the names and ages of his Austrian children––and a different possible name for his first wife. 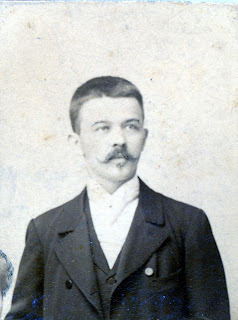 Johann Koroschetz traveled to Hamburg to board the ship, the S.S. Blucher, destined for America, on August 26, 1908, at the age of thirty-seven. 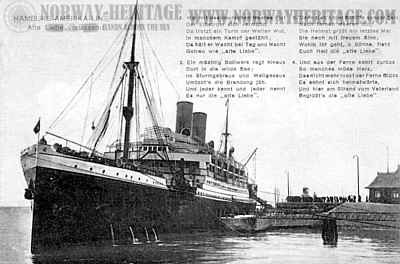 He's the only one of my immigrant grandparents to leave from a port other than Bremen. He arrived on September 6th in New York. The ship's manifest (I've posted the Ellis Island Passenger record, as it's easier to read) indicates that he was married "W" for "Wed"). It wasn't unusual for a husband to travel alone, and later send for his wife and the children to join him, once he had a job and a better understanding of the new country to which he would be bringing his family. But no family from Europe ever joined Johann, who changed his name to John once settled in. It seems that John originally settled for a time in Buffalo, New York. I can draw this conclusion based on the postcard below, addressed to Johann Koroschetz (my mom's father) in Buffalo. 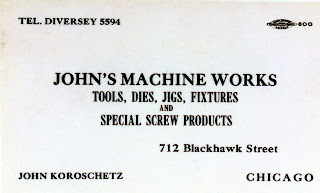 This postcard isn't dated, but the contents indicate John had recently left. 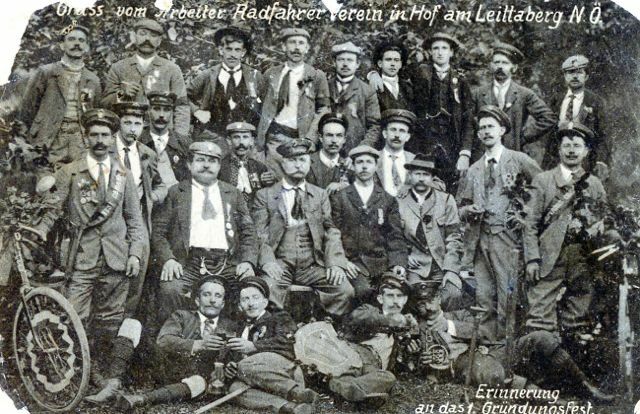 The photo on the front is of a large group of men, a bicycle at the left, two guys lying on the ground clinking beer glasses and a couple with horns. 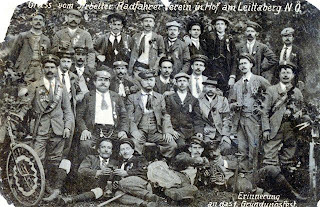 The caption at the top says: Greetings from the Workers' Bicycle Club in Hof at Leittaberg [Leithaberge]," a town just a few miles southwest of Vienna, shown by the red dot on the map. The writer, tells John that "things are getting worse and worse" back home in Austria. He goes on, "There's almost no water, winter is coming, the weather is already very cold, and once the water freezes, we'll have even less." He then comments: "You guessed it," as if Johann had predicted that things would be getting worse, and he made up his mind to leave. If I interpret this postcard correctly, something bad was occurring in Austria, and John had nothing to keep him there, as we'll see next time when we look at the court documents he filed in Chicago, declaring what had happened to his marriage. At age twenty-one, on September 17, 1892, John Koroschetz, my mother’s father, was working in a machine shop (he was either a machinist or tool and die maker) in Graz, Austria, when something went terribly wrong. Was the machine mis-timed? Was he distracted for a moment? Was he trying to work too fast? Whatever the reason, the embossing machine on which he work crushed off the ends of the ring and little fingers of his left hand. At least he had some legal protection and received the equivalent of workers’ compensation. How do I know? This legal document, which my mother, unable to read the formal writing, had mislabelled as “divorce papers,” turned out to be something entirely different! My Rosetta Stone in Germany, Meta, deciphered its real content and set me straight. It’s actually "Arbeiter-Unfallversicherungs-Anstalt für Steiermark u. Kärnten,” meaning Workers Accident Insurance in Graz. I know now that he received a half year “pension” as compensation. He received 3 Florin (Gulden) and 56 Kreuzers per month, based on a portion of his annual salary. Of course it could have been worse––he could have lost his whole hand, but Johann was also a musician, making the loss especially acute. 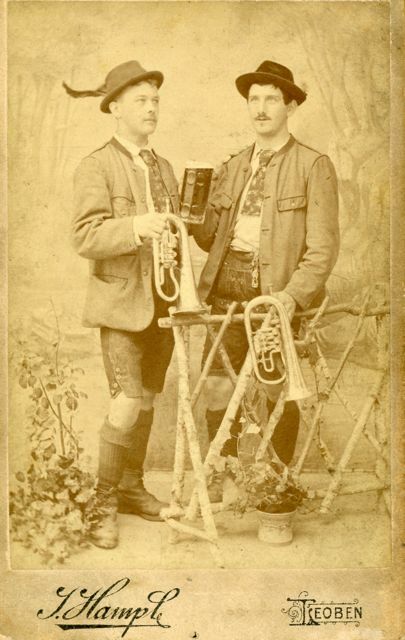 Despite his missing fingers, Johann continued to play multiple instruments, from trumpet to mandolin and harmonica. Above is a photo of him as a young man (that’s Johann on the left, friend on the right) with his trumpet. Mom says that sometimes, just to be a rascal, he would play his trumpet in the alps, knowing a wedding was taking place in the valley below. His notes would echo off the surrounding mountainsides, competing with the festivities below. Johann was a Schuplattler too. Young men joined in a traditional Austrian folk dance, slapping their feet (Schu = Shoe) and thighs to the beat of the music, trying to impress the girls. Here’s a video of some modern-day Schuplattlers. Use the button under the video screen to zip ahead about one minute (1:00) to get to the real “action.” Would this dance make you want to marry one of these guys? Different era, right? If the video doesn't play (as Blogger is just a brat sometimes) try this link: Schuplattler video. Johann was really quite a bright fellow. He later became an inventor with several patents to his name. 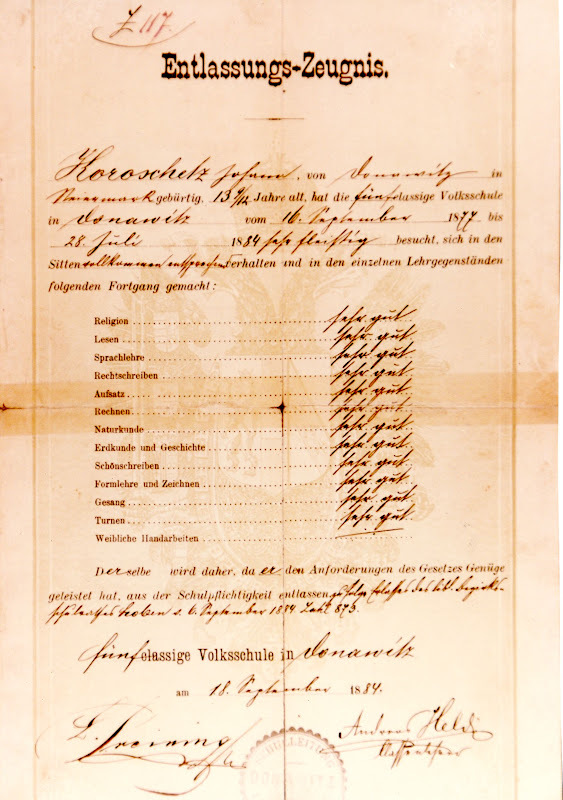 Here’s his report card from when he was thirteen years old in Graz, Austria. It's dated September 18, 1884, indicating he had attended elementary school from Sept., 16, 1877- July 28, 1884. In every subject he had earned “sehr gut.” That means “very good,” which I understand was the highest mark. Way to go, Grandpa! of a woman's hair. Maybe first wife? 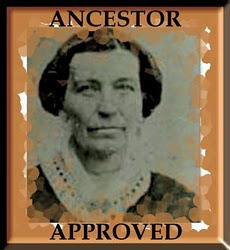 Johann married a woman named Caroline or Charlotte, on June 21, 1896, when he was twenty-five years old. We have no photos of this woman, but I think I spot the left side of her hair in this photograph of my grandfather “as a young man” as my mother labeled it. We know little about this woman, nor the four children they had together, other than their names. But we do know his side of the story as to what destroyed their marriage, and that he came to America alone, never to see those children or his first wife again. Next week: Desertion and divorce.